Cadalyst Editors: Follow @Cadalyst_Mag on Twitter for updates from the Cadalyst staff. Lynn Allen: Get the latest thoughts and insight from Cadalyst contributing editor Lynn Allen — follow @Lynn_Allen on Twitter. Twitter Hashtags: Check out our list of CAD-related #hashtags for Twitter. Twitter Chats: Cadalyst hosts live Twitter conversations around CAD-related topics. See our Twitter Chats page for updates. Cadalyst: Like Cadalyst on Facebook and we'll respond with the latest updates, insider info, and other fun stuff from the world of CAD. CAD Managers Unite! Cadalyst contributing editor Robert Green leads this social group addressing all things CAD management. Join CAD Managers Unite! Cadalyst Channel: Find CAD video tips, technology updates, and more on the Cadalyst YouTube Channel. Cadalyst: Make professional connections and join discussions via our LinkedIn group. Cadalyst: Share all things Cadalyst on our Pinterest pinboard. RSS feeds update you when new articles of interest are posted on Cadalyst.com. Click on the feed of your choice and you will be shown a sample of recent articles in that feed and prompted to select the RSS reader of your choice before you confirm your subscription. 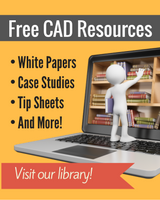 News and analysis, step-by-step tutorials, communication tips, and much more for the CAD manager. News and analysis, case studies, feature articles, and much more CAD-related content for professionals in the field of AEC (architecture/engineering/construction). News and analysis, case studies, feature articles, and much more CAD-related content for manufacturing professionals.